Me: I don’t think I can make it. Him: Free rum at 6:30 and you can’t make it? Who are you? 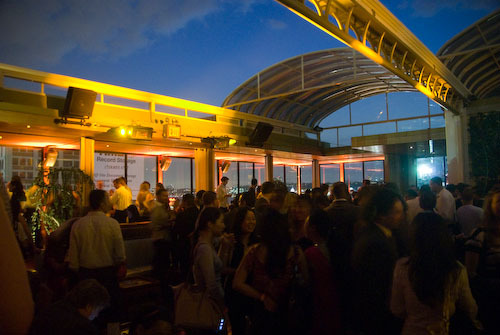 Met up with some friends at the Hudson Terrace last week. Think that’s why I love NYC – you can be sitting down in front of a court pleading one second and then drinking a nice aged rum with a slice of orange at an open air, open bar the next. Him: I dunno, not my thing. This one fella kept shoving people aside to get to the bar, me included. Wanted to get in his face but since I’m not a child, decided against it. But this’s not to say I didn’t entertain myself. He leaned in to ask the girl sitting next to me to dance and she did. Sitting back down, he went to get them drinks. Me: He’ll ask you to marry you tonight, you know. Her: (laughing) What makes you say that? Me: He seems the type. Kinda pushy. Brave when he’s drunk; dull otherwise. So what’s your deal? Her: I’m here from Toronto. Me: Wow, your American is excellent. We chatted for a bit and when the guy came back, he scowled at me but handed her her drink. Me: I just saved you from a night of boring. Her: (nodding) You did, you did. Me: (turning to her redheaded friend standing in front of us) Hey Red, I’m going home to see my lovely fiancee, why don’t you take my seat before Mr. Dull takes my seat and annoys your friend all night. Her: (laughing) You got it, mister. Never a dull moment if you don’t want it here. HA! You're clever. But the real question here, who would pass up free rum?